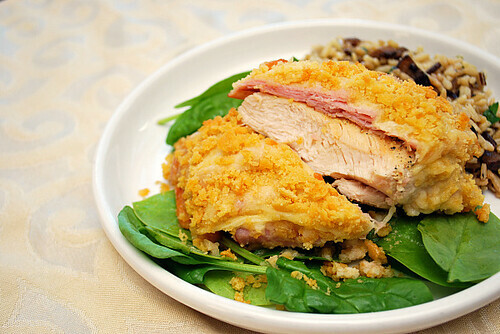 Chicken Cordon Bleu may seem like a fancy dish since traditionally, it consists of ham and Swiss cheese stuffed into a chicken breast, which is then coated and baked. Preparing it can be time consuming and messy. But this recipe avoids all that. Instead of stuffing these ingredients in the chicken breast, they are laid on top and baked. Boneless, skinless chicken breast is seasoned and browned before placing in a baking dish. Each chicken breast is brushed with Dijon mustard before slices of ham and Swiss cheese (preferably Gruyere or Emmenthaler) is laid on top. For that crunchy coating, crushed butter crackers are sprinkled over the adorned chicken. To finish off the dish, a creamy white wine and tarragon cream sauce is made and everything bakes up to perfection. I served this over a bed of baby spinach and portobello wild rice pilaf. Adjust the oven rack to the lowest position and heat over to 475 degees. Pat chicken dry with paper towels and season with salt & pepper to your tastes. Heat oil in a large skillet (such as a cast iron one) over medium high heat until just smoking. Brown chicken, about 3 minutes per side. Transfer chicken to a 13x9 baking dish. Add cream, wine, 2 teaspoons of mustard, and tarragon to the now empty skillet. Taste the mixture and season with salt and pepper to your tastes and remove from heat. Meanwhile, spread the remaining mustard over each browned chicken breast, lay 2 slice of ham on top and mound over each breast 1/4 cup of shredded cheese or a few slices of cheese. Sprinkle the cracker crumbs over the cheese, pressing to adhere. Pour the pan sauce around the chicken without disturbing the crumbs. Bake in the preheated oven until the chicken registers to 160 degrees, about 15 minutes. This is one of my favorite dishes of all time, and it looks so easy and yummy!!! Thanks!! Oophs. I am usually a big fan of simplified, 'traditional' recipes. Most save a lot of time and make few, if any compromises on ingredients and taste. Sorry, but this one just flooped for me. Perhaps I was expecting too much. I have made the original (long form) for years. Yes, it is a little work, but I've done it so many times that it has become a no-brainer. Thanks for sharing this and I certainly do not regret giving it a try. This time, I'm going to stick with the original.